The first new-style orange emergency refuge area on the M3, near Camberley. Over the last few years, British drivers have got used to using smart motorways, where the hard shoulder is used as a traffic lane during busy periods. But what happens if you break down? As it turns out, smart motorways have been modified to include emergency areas at intervals along them. These are basically laybys, fitted with an emergency phone with which you can summon help. The hope is that if you run into trouble, you’ll be able to make it to the next area. The problem is that many drivers aren’t aware of these emergency areas and even if they are, may not try to make it on to the next one. 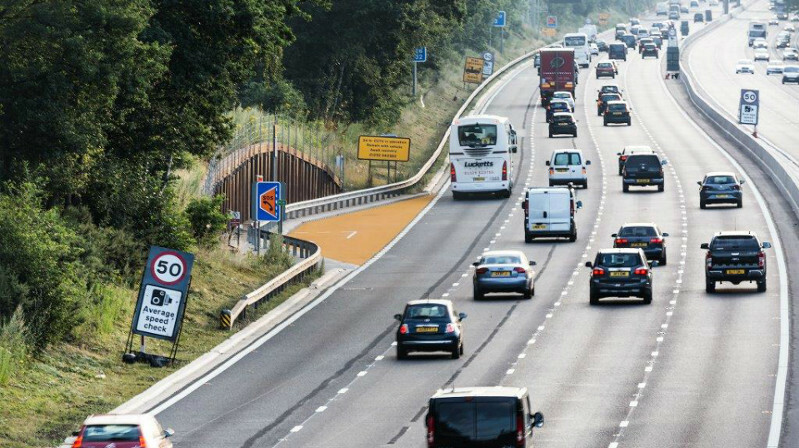 To help make smart motorways easier to use, Highways England is trialling some orange emergency areas. As you can see in the picture above, these have orange road coating to make them more noticeable. It’s also hoped that the orange colouring will discourage drivers from using these areas for non-emergency purposes. They are not suitable for use as rest areas and drivers should remember that stopping on motorways is not allowed unless there’s an emergency. The first orange emergency area went live on 14 July on the M3, near Camberley. The agency plans to upgrade more motorway emergency areas to the new orange design if the trial is successful. The good news is that there is an ongoing review into the design and spacing of emergency areas on smart motorways that’s due to report this autumn. So this common concern may be addressed as we head into 2018. In the meantime, look out for the (black or orange) emergency areas next time you’re on a smart motorway. Remember that if at all possible, this is where you should aim to stop in an emergency.